Our modern western thought tends to think in terms of straight lines thereby creating history, individual and societal. The basis of a calendar is positional cycle. With the beginning of a new cycle the “history” is erased. Of course there are cycles that contain other cycles and they may repeat many times within the greater cycle. For example, the moon completes its cycle many times within the solar year and there are 25,920 solar years within the Great Year, otherwise known at the Precession of Equinoxes. The cycles start anew, though looked at from the context of a greater cycle its position has shifted. The development of the Mesoamerican calendars start as early as 1,500 BC, during the Olmec civilization, or around 600 BC with the Zapotec. Eventually they were perfected with the Maya from about 200 BC onwards. Scholars do not know the exact origin of the calendars, but there is evidence the Barber people of North-West Africa used a 520-day cycle which is twice a Tzolkin. The oldest Long Count dates is from an Olmec site and Tzolkin dates have been found from 600 BC and 650 BC at Zapotec and Olmec sites. Our decimal system, base-10 system, counts 10’s, 100’s, 1000’s and so on where as the Maya used a vigesimal system, a base-20 system, counting in units of 20’s, 400’s, 8000’s and so on. 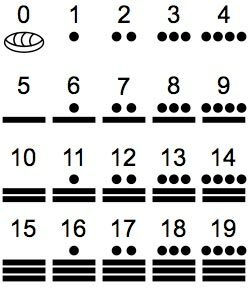 This place numeration system including the zero had been in use 1000 years in Mesoamerica before it was used in India around the 8th century. Our system of numbering increases by a factor of 10 from left to right and is read from left to right whereas the Maya increase by a factor of 20 from bottom to top and is read from top to bottom. One exception to this is in the long count calendar the third position is only 18 times the second position giving 360 days instead of 400 day so it approximates the solar year. 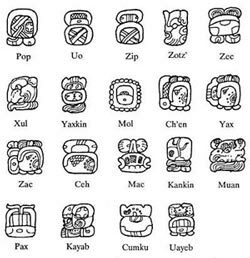 Tzolkin means “count of days” in the Yucatec language, also ch’olk’ij in Quiche and tonalpohualli in Mexica (Aztec) languages. This is a 260-day calendar where thirteen day-numbers are combined with twenty day-signs progressing in order as in 1 Imix, 2 Ik, 3 Akbal, 4 Kan and so on to 260 unique day-number / day-sign combinations. The Quiche Maya say it is based on the period of human gestation and the maize agricultural cycle. Either way it was used as a determiner of ceremonies and prophecies of the Maya. The Haab or vague year consists of eighteen months of twenty days each plus a nineteenth month of five unlucky days. The Haab totals 365 days, but no leap day was added. The Calendar Round is the combination of Tzolkin day positions against the Haab which only reoccur once every 52 years or 73 Tzolkins, a total of 18,980 days. 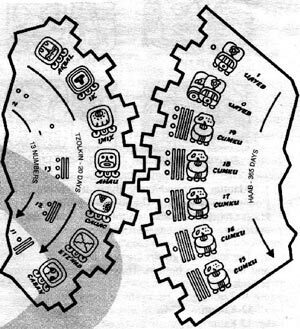 Not much is known about the Maya customs regarding this calendar, but the Aztec’s custom about the end and beginning of each Calendar Round is called the New Fire ceremony. It is believed the ceremony started with the people who built Teotihuacan, then to the Toltec, then to the Aztecs. The Long Count starting date of this era is 13.0.0.0.0 4 Ahau 8 Cumku, in our calendar is August 11, 3114 BC. Each era is 13 baktuns, which is 1,872,000 days or 5,200 tuns, just over 5,125 solar years until the end and beginning of a new era. The current era we are in ends and a new one begins on December 21, 2012. The interesting thing about the Long Count is “end date” is a rare alignment of the winter solstice sun with the dark rift of the Milky Way. This is a processional alignment indicating they not only knew of the Earth’s precession, but could calculate it with precision. The Maya called the dark rift the xibalba be, black road leading to the underworld. 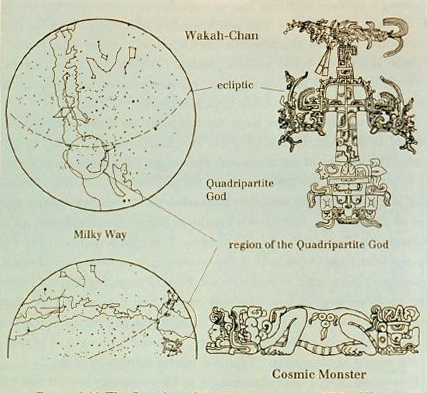 They depicted this as the rebirth of the sun in the mouth of a crocodile or jaguar-toad, and also in the ballgame where the ball going through the goal represented the galactic alignment.